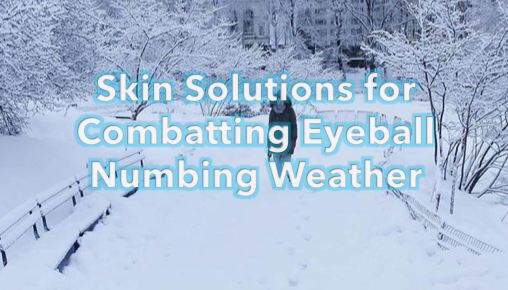 When the beauty pages talk about freezing your face, they aren’t referring to unbearable eyeball numbing weather. In fact, this polor vortex wreaks havoc on your skin, which is why it’s extra important to prep and prevent irritated, chapped, dry skin and hair. We’ve scoured the shelves and pulled together a list of gentle cleansers that won’t strip your skin, hydration boosters that supercharge your moisturizer and protective emollients to shield your skin and hair, you’re ready to meet winter head-on. Give winter the middle finger and don’t spend the rest of the season hibernating. Don’t let your evening routine dry out your skin. When you massage this innovative gel cleanser into your skin, it transforms into a lightweight but powerful cleansing oil that leaves skin clean, soft and perfectly balanced, never dry or stripped, and easily removes all makeup. Formulated with our spa-velous blend of seven spa essential oils, which work synergistically to deep clean without drying. Perfect for gently cleansing irritable, winter-dry skin, the Clarisonic Luxe Brush Head Collection delivers uncompromised cleansing efficacy with enhanced hydration. Developed for face, eye, and body, the dynamic dual-layer design features a soft, massaging top layer over a firmer, efficacious lower layer. Filaments are almost double the length, creating a greater sweeping action with increased fluid forces, gently massaging skin to cleanse and simultaneously increase natural hydration levels. This part serum-part oil amps up your moisturizing routine in the winter months; helping to greatly increase the efficacy and absorption of your favorite face creams. 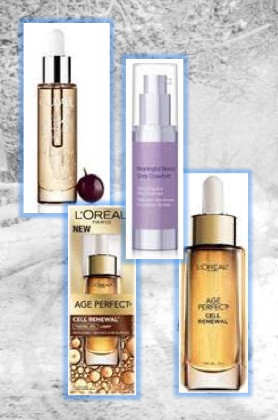 Formulated with cutting edge anti-aging ingredients – Stabilized Vine Resveratrol, Viniferine, and Grape-Seed Polyphenol, it includes five anti-aging oils that also have incredible hydrating properties. The lightweight texture immediately absorbs into the skin for a smoother, firmer, plumper, and more radiant complexion. This advanced facial oil is formulated to combine proven skin surface renewing ingredient, Lipo Hydroxy Acid, with the hydrating, nourishing power of light essential oils. As a result, wrinkles are visibly reduced, and in the cold season, skin feels smoother, softer, firmer, and more resilient. In your palest, driest winter weather moments, this NEW dual-action serum comes to the rescue to hydrate and prime the face. Designed to lift sagging, aging skin and fill and plump fine lines and wrinkles, it’s infused with a rare, exclusive orchid extract to support healthy collagen and elastin production. Key ingredients like Hyaluronic Acid, vitamin C and the brand’s Encapsulated Melon Extract hydrate the skin. When skin is hurting from the harsh cold, this fresh balm combines the hydrating properties of an intense skincare with the luscious softness of a hydra-quenching gel. Its original and delicately rose-scented "aqua-fluffy" texture moisturizes, revitalizes and energizes even the thirstiest, most asphyxiated skin, thanks to [MR+ S]* active ingredients that ensure continuous three-layer hydration. The perfect, all-purpose moisturizer - rich in nourishing Vitamin E and antioxidants, this melts-at-first-touch oil delivers unprecedented care to your skin and hair. It nourishes extremely dry, chapped skin, tames frizz and fly-aways, minimizes hair breakage and split ends and smooths chapped lips. Cold air means dry skin. Get a necessary added layer of moisture and protection with this intensive overnight treatment, which helps to replenish moisture, soothe and calm skin, and reduce the look of fine lines and wrinkles while you sleep. Nourishing Sweet Almond Oil and Aloe help moisturize and repair the look of dry, damaged skin while Sepi-Calm™ S* helps reduce irritation for all skin types, especially very dry and sensitive skin. A deeply nourishing hydration cream formulated with patented NIA-114 technology and moisture seeking molecules, known for their ability to maintain water reserves and prevent dehydration. Energizing Oxygen Complex breathes new life into skin to activate cell renewal and stimulate collagen formation, diminishing the appearance of lines and wrinkles. 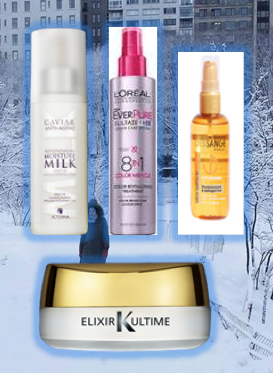 Winter does not have to mean dry, static-ridden, knotty hair. A few spritzes of this ultra-hydrating spray will drench your locks in weightless moisture for maximum softness and shine. Clinically proven to absorb instantly and deep condition for 20x more hydration and a 90% improvement in detangling, its formula also adds elasticity to reduce breakage. Give your hair the hydration it craves during winter with Oleo Miracle Replenishing Oil. The reparative oil works to help trans­form hair suffering from thermal, chemical and environmental damage for a visibly softer, healthier look. Offering intense nourishment, the formula is in­fused with three key natural oils: Argan Oil, Camelia Oil and Pracaxi Oil, leaving hair smooth, bouncy and manageable. 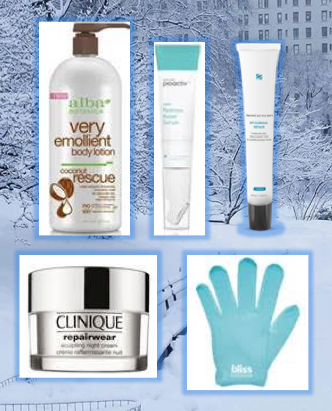 Combat winter’s harsh weather and restore dry, damaged hair. Enriched with 15 precious healing oils to restore split ends, revive highlights, control frizz and more, Serum Solide is the FIRST-EVER versatile oil serum in a solid form. Ideal for dry, damaged, thick or frizzy hair, use by warming a dime-size amount of the serum between fingers. The solid serum instantly melts and can be applied to targeted areas of hair. As winter continues to damage hair, this color-revitalizing treatment instantly delivers eight essential benefits for color-treated hair: protect color from fading, even out hair’s texture, boost radiance, shield against heat damage, quench dry hair, detangle instantly, control frizz & flyaways and silken hair from root to tip. Simply spray once or twice on wet hair and comb through prior to styling. This ultra-moisturizing lotion instantly delivers potent hydration with a unique blend of unrefined Coconut Oil, Coconut Milk, and Shea Butter. This lotion uses only unrefined, virgin coconut oil that is cold pressed from fresh coconut meat. This process allows it to maintain more skin nourishing phytochemicals, vitamins and antioxidants that provide immediate relief to even the driest skin. Pamper parched paws with our mitt moisturizing glamour gloves. In 20 minutes flat, dehydrated dukes are transformed into something so soft and smooth you'll be absolutely smitten over your new mittens! 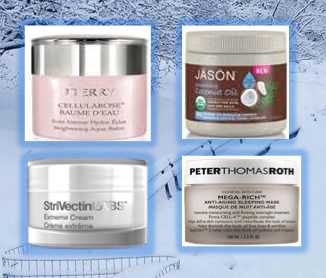 Hydrate your skin during the harsh winter months with Repairwear Sculpting Night Cream, equipped with eight potent ingredients to help skin rebound. These ingredients help support skin during its sleep cycle, when skin’s repair ability peaks, supporting natural skin cell regeneration. Murumuru Butter and Linoleic Acid work to prevent dehydration and maintain an optimum balance of moisturization leaving skin feeling soft, smooth and comfortable. The cold wind can chafe your skin, leaving it red and irritated. Relax the skin with this cooling serum designed to instantly reduce acne-induced inflammation. Featuring calming botanical extracts that help relieve swelling and irritation and improve the overall appearance of the complexion, the formula glides directly onto the skin via a built-in stainless steel roller. Store in the refrigerator as needed. Perfect for skin sensitized by harsh environmental aggressors, this therapeutic treatment combines beta glucan and centella asiatica to provide a protective veil for traumatized skin while facilitating the processes necessary to accelerate restoration of the skin’s barrier. Epidermal Repair is clinically shown to greatly diminish redness and soothe irritated skin.